Please click here for a PDF of the program in detail and abstracts. Poster Presentation Setup in the Pine Room from 7:30 am to 5:00 pm today. Authors will be present this afternoon from 5:40–8:00 pm in the Pine Room. 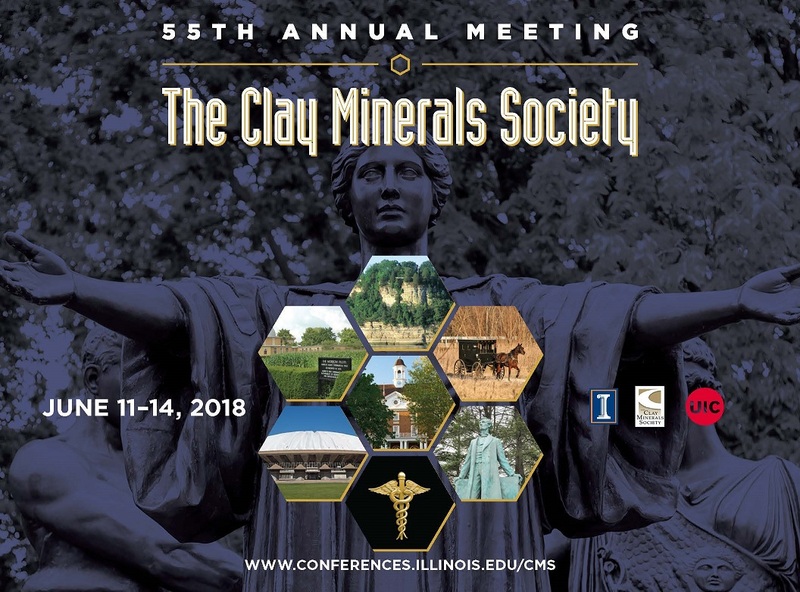 2:20 pm-2:40 pm Brian Gregoire*, Eric Ferrage, Fabien Hubert, Thomas Dabat, and Sabine Petit: WHAT POLARIZED ATR-FTIR SPECTROSCOPY CAN TELL US ABOUT CLAY MINERALS? 3:40 pm-4:00 pm Jason Austin*, Amelia Perry, Daniel deB. Richter, and Paul A. Schroeder: MODIFICATIONS OF 2:1 CLAY MINERALS IN A KAOLINITE DOMINATED ULTISOL UNDER CHANGING LAND-USE REGIMES AT THE CALHOUN CRITICAL ZONE OBSERVATORY, SOUTH CAROLINA, USA. 2:40 pm-3:00 pm Macarena Leal* and Thomas B. Scott: A STUDY OF GEOLOGICAL DISPOSAL FACILITIES ALTERATION PHENOMENA IN BENTONITE. 4:20 pm-4:40 pm Paul Wersin*, Jebril Hadi, Andreas Jenni, Jean-Marc Grenèche, Daniel Svensson, Patrik Sellin, Olivier Leupin, and Florian Kober: WHAT CAN WE LEARN FROM IRON-BENTONITE INTERFACES WITH REGARD TO SAFETY ASSESSMENT OF HIGH-LEVEL WASTE REPOSITORIES? 4:40 pm-5:00 pm Rebecca Smith*, Briony Horgan, Elizabeth Rampe, and Erwin Dehouck: ARE AMORPHOUS PHASES ON MARS PRECURSORS TO CLAY MINERALS? 5:00 pm - 5:20 pm Michael Velbel*: FATE AND TRANSPORT OF SOLUTES IN MICROPOROUS CHONDRITIC ASTEROIDAL AQUIFERS—AND CORES OF OCEAN WORLDS?